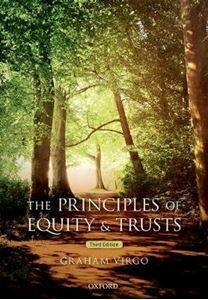 Quick overview The Principles of Equity & Trusts brings an engaging, contextual approach to the subject in this best-selling textbook. Graham Virgo explains the complex issues of trusts and Equity with unparalleled clarity, offering a rigorous and insightful commentary on the law and its contemporary contexts. The Principles of Equity & Trusts offers a refreshing, student-focused approach to a dynamic area of law. In the third edition of his best-selling textbook, Professor Graham Virgo brings his expertise as a teacher to present an engaging, contextual account of the essential principles of trusts and their equitable remedies. Virgo states the law in plain terms before building on an area of debate and encouraging students to fully engage with the inherent issues within the subject. Concise and authoritative analysis enables students to grasp the principles of trusts, develop the confidence to engage fully with the subject area, and excel in their studies. Virgo approaches the topics with unparalleled clarity and provides the academic rigour for which this text has come to be relied upon. Combining expert knowledge and comprehensive coverage, The Principles of Equity & Trusts is the ideal companion to a course in trusts.